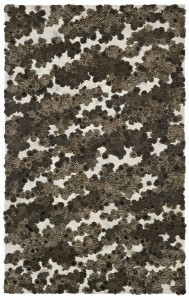 Virgil de Voldère Gallery is proud to present its second solo exhibition of works on paper by Charlene Liu. 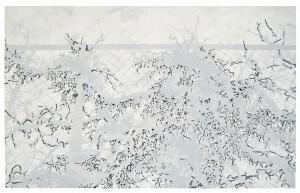 Using an amalgamation of mediums, processes, and techniques—including watercolor, ink, acrylic paint, woodcuts, and screenprint, as well as repetition, collage, and patterning—the artist presents a singular vision of the natural environment that comes to reflect complex, multivalent emotional states. 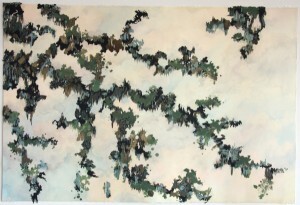 Drawn to the diminutive, the overlooked, and the ephemeral, Liu presents landscapes with points of view as seen through the undergrowth or from the ground looking up, which differs from the panoramic vistas of her earlier work. Developed out of the fantastical, abstracted, and almost psychedelic images of floral and fauna created and shown earlier this year, the work in this exhibition evocatively captures the intense beauty of nature with its forceful oppressiveness. A silhouette of branches against the sky or a brambly thicket of weeds can potentially induce feelings of fracture and dissolution. 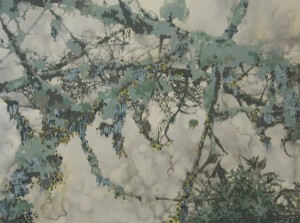 But rather than emphasizing degeneration or apocalypse, Liu accentuates the feelings experienced during, for example, the melancholy of twilight, or the sense of imminent danger the forest often presents. Hers is an art that depicts the impermanent and incomplete shape of things, where beauty and intentionality are found during moments of inception or subsiding—before the bloom or after the decline. 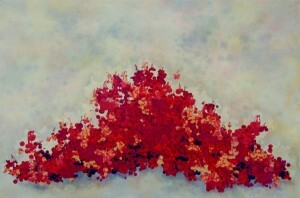 In two works on paper, a massive spread of pine cones and a generous cluster of cherries, continue and expand on, in an unusual way, the long tradition of nature imagery in art, as seen in the sheer visual abundance in seventeenth-century Dutch still lifes and the sexualized flowers of Georgia O’Keeffe. For Liu, though, the repetition and proliferation of a single motif creates an amorphous visual space that shifts between illustration and abstraction, between figure and ground, and between becoming and dissolving. 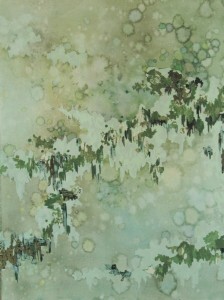 Born in Taiwan in 1975, Liu earned her MFA at Columbia University in 2003. Solo exhibitions of her work have been held at Shaheen Modern and Contemporary Art in Cleveland (2008), Taylor De Cordoba in Los Angeles (2007), Virgil de Voldère in New York (2006), and Andrea Rosen Gallery, also in New York (2003).